The Permanent University is a scientific, cultural and social program that is developed by the University of Alicante and is aimed at promoting not only Science and Culture, but inter-generational relationships as well, with a view to improving the quality of life that the older generation enjoys and encouraging their active participation in dynamic social and community activities throughout the province. The Province of Alicante, situated on the south-east coast of the Iberian Peninsula, belongs to the Valencian Community. The Permanent University was inaugurated in 1999 and has approximately 1,325 students scattered among its 2 university centres at which a program of 120 different courses are conducted, all complimented by a wide range of cultural activities (work-shops, seminars, publications, theatre, cultural visits, etc. ), in collaboration with the Students Association, which participates actively, and co-ordinates with the Office of the Vice-President of Studies Planning, Training Actions & Quality Standards. The program’s most outstanding feature is its great dynamism and its active student participation. 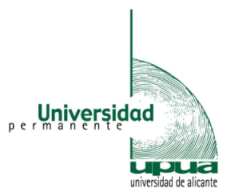 Since 2010, the Permanent University assumes the presidency of the AEPUM - Spain’s National Association of University Programs for Older Adults, which is made up by 44 Universities with a total of more than 40,000 students. AREAS OF ITS MAIN COMPETENCES AND EXPERIENCE - WHICH AREAS ARE MOST DEVELOPED, WHERE IS GOOD PRACTICE DEVELOPED? International Relations (integration of foreign students and contact with other institutions in order to promote the relations between students). Integration of adults in New Technologies and Languages (English, French and German). Health training for active ageing. Research done by adults and intergenerational relationships. WHAT DOES THE UPUA PROGRAM SEEK TO? Contribute to older adults’ continuous adaptation process to our fast-changing society. Develop new learning approaches using information and communication Technology (ICT). Respond to such needs as: the democratization of knowledge, the reduction of social injustices, the social integration and participation, and the generation of opportunities to extend active life outside normal work settings. The UPUA programme (720 hours of subjects freely chosen by the student) forms part of the specific framework of older adult’s university education. When they have completed the full programme, the University of Alicante will give them a supporting diploma with a list of the subjects they have studied.